I put coleco.rom in /system (where all other bios files are, and all other emulators are running fine), and also tried /system/bios and /system/bluemsx . When I start a game, the screen flickers one time, returns to the RA menu and a message bluemsx.git appears. Apparently, something is wrong or missing. Could someone give the exact folder and file structure to get ColecoVision games working on RetroArch for Windows? "BIOSLink The blueMSX core requires the ‘Databases’ and ‘Machines’ folders from a full installation of blueMSX. Copy the ‘Databases’ and ‘Machines’ Folders to RetroArch’s System directory." Which download did you use to get the Database and Machine folders? Change the machine type to Colecovision and save game options file. 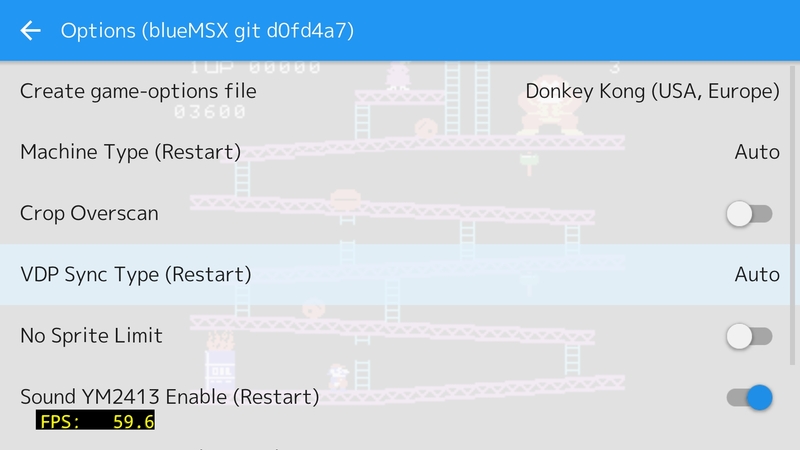 try looking here: [solved] MSX / MSX2 "Failed to load content"
Confirmed, I have this. Can you mention which files these 2 folders should content? This goes wrong. The screen flashes, returns to RA and “bluemsx.git” appears at the bottom of the screen. I read about this. From what I understood, this was only obligatory for an older version. The “auto” option should be OK because in a more recent version, autodetect was built-in and proved working. Hope you help me further! Thanks! Thanks. I did read it, and I’m more confused. Do you think we need to do a full install of bluemsx? I’m asking because https://buildbot.libretro.com/.docs/library/bluemsx/#how-to-install-the-bluemsx-core states we only need the core (and its update) downloaded from RA. Perhaps the folders from the blueMSX Github repository are busted. Can you try the folders from an official blueMSX installation instead? Cool I will check this out and update my core, its been a while. Going through the Databases and Machines folders in blueMSX’s repository, I’m noticing it’s missing bios files from blueMSX’s full installation. I would fix this but idk If it’s allowed. This did the trick. Thanks a lot! The RA/LibRetro distribution of the BlueMSX core. One of the great things about RA is that almost every emu runs at the push of a button, so it’s a bit awkward that for BlueMSX a bunch of files from another source need to be downloaded and put in place. But maybe this is a licensing issue, IDK. Another thanks. I’m off playing DK! No, it’s not “better”. It’s WAY, MUCH better! Sorry to bump the topic after so long but as it’s not set to solved I believe it’s the right place to post. After a few days lost trying everything I could find about running ColecoVision in RetroArch (1.7.6) using the latest blueMSX Core in Windows 10, I was left with no option besides coming back here to the most complete topic available. Some additional info: Retroarch is running normally for all my other systems and the Roms I have work normally in my Retropie that also uses Retroarch. In sum, going back to the problem, I get the message “failed to load content” after selecting any Rom and pointing to blueMSX core in RA. Any idea or suggestion on how to find what’s wrong? Many thanks in advance for all the great work and any help is really appreciated! Game started all ok. Hit a couple of buttons to get into gameplay. Check your game file worka ok somewhere else or try other games with this core. Thanks for checking! I reviewed and did everything once again, just in case, but still no luck. If you guys have any idea on how to pinpoint what’s wrong it would be really appreciated. Thanks again!